The enduring myth of the Muslim vote bank in Indian politics doesn’t hold. Of India’s 1.3 billion population, 14 per cent practice Islam. In absolute terms, this is a large community of 180 million individuals. By some estimates, their demographic weight could potentially determine the fate of one in every three Lok Sabha constituencies. This has given rise to the enduring myth of the Muslim vote bank in Indian politics, i.e., the entire community that practices Islam votes in unison. This myth also includes the notion that the Muslim turnout is always higher, and they vote on the advice of religious clerics. Yet, the Muslim representation in Lok Sabha and most state assemblies is meagre. What explains this paradox? Here are five myths about the voting behaviour among Muslims in India. First, despite the widespread belief that a Muslim voting for the Bharatiya Janata Party (BJP) is against the community’s interest, a small segment does vote for the party. Recent data indicates a well-identified pattern among the Muslim voters of the BJP. While the context may be different, strangely a similar proportion of African-Americans in the United States have consistently voted for the Republican Party. Second, there is no Muslim vote bank in India. Even in 2014, when the Muslim vote should have been the most polarised, the community voted for different parties in different states. Moreover, the Muslim identity on the ground is highly fragmented based on various religious denominations, linguistic differences, caste divisions, and class hierarchy. The population size (and geographical dispersion) of the community within the state plays a crucial role in determining their voting behaviour (See Table 1). Note: Except Lakshadweep, all other states and Union Territories have less than 7% Muslim population. Third, while the Congress party receives the maximum votes among Muslims nationally, its support base within the community has never exceeded beyond 40 per cent in the post-Babri Masjid era. The Congress also largely relies upon the support of the upper segment among Muslims (and not those who are economically downtrodden). Thus, which party a Muslim would vote for is rooted in the logic of party competition in that state. For instance, in a state with a bi-polar contest, the Congress wins most of the Muslim votes if the BJP is its only competitor. And if a strong regional player is present in the state, then the Congress has to fight hard to win the support among Muslims (See Table 2). In some cases, regional parties garner maximum votes from the community. 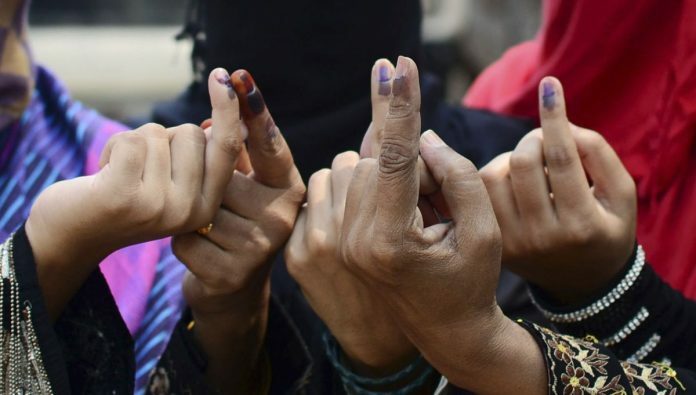 For example, the Muslim vote in Jammu and Kashmir is divided among the National Conference (NC) and Peoples Democratic Party (PDP), among the Trinamool Congress (TMC) and the Left Front in West Bengal, among the Samajwadi Party (SP) and the Bahujan Samaj Party (BSP) in Uttar Pradesh. Fourth, political parties that have attempted to exclusively mobilise Muslims in certain states – such as the All India Majlis-e-Ittehadul Muslimeen (AIMIM) in Telangana and Andhra Pradesh, the All India United Democratic Front (AIUDF) in Assam, the Peace Party in Uttar Pradesh, and the Indian Union Muslim League (IUML) in Kerala – have failed in their pursuit of winning community support en masse. These parties have their pockets of strength in few districts, but they have never managed to create a state-wide loyalty among Muslim voters. The AIMIM is restricted to Hyderabad-Secunderabad region and the AIUDF is a party of Bengali-speaking Muslims. 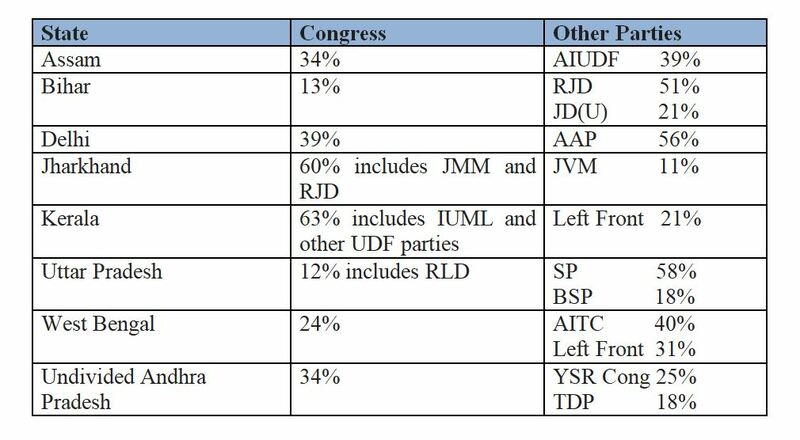 Less than one in five Assamese-speaking Muslims have voted for the AIUDF in the last three elections (Table 3). Fifth, a deeper scrutiny of Muslim voting behaviour in Uttar Pradesh confirms that Muslims are no more likely to participate in electoral activities than the average voter in UP. Religious clerics do not influence their voting decisions and they vote on similar issues like other social groups in the state. While the BJP’s expected performance in an election is an important factor most Muslims account for, their voting choice is also driven by choosing the best option among the contesting candidates, the welfare policies, the issues of law and order, and leadership among many other things. There is no uniform pattern on who Muslims vote for. Sometimes they vote overwhelmingly for one party, and at other times they are more fragmented along various cleavages within the community. In most parts of the country, the Muslim population is numerically small, they are under-represented in politics and bureaucracy, lag in education and economic means, and thus fail to make their electoral weight count. But in places where they have a sizeable number, they participate like any other large community. In that sense, there is nothing unusual or unique about how Muslims vote in India. The writer is a PhD student in political science at the University of California at Berkeley, US. Writer seems to be a Muslim apologists & firm supporter of congress, data furnished belies the title. The article does not break any myth. The data shows a good percentage of them vote enbloc. Need to know the the total vote share of minorities on a pan India basis with statewise break up and which political party receives what share of the minority votes. Disagree. Unless you’re proclaiming the myths didn’t exist at 1st place. And why do you need that info for free, are you a political analyst or a strategist?